For over a decade Tony Kitous has been Britain's most passionate provider of contemporary Lebanese and North African food. His restaurants were the first in London to merge traditional Arabic cooking with easy contemporary eating. There are now seven Comptoir Libanais restaurants in London with more planned in the next 18 months. The success of Comptoir Libanais restaurants centres on an easy, relaxed cafe-style of food: light Arabic home cooking mixed with familiar bistro flavours and techniques. Tony Kitous' recipes combine fresh vibrant vegetable dishes with simple grills, flat breads, grains, herb salads and dips. Pastries are richly flavoured and delicate, made with syrups and spices. Absolutely the menu for today and adaptable for the home cook. Containing eighty recipes, each one with a full-page photograph, Comptoir Libanais makes achieving a great result easy at home. Tony Kitous' approach and shortcuts inspire new ways to prepare readily-available ingredients: big on spices, fresh herbs and bright citrus flavours drawn from traditional Arabic cooking. The book is strong on vegetarian and vegan dishes, alongside simple grilled or poached meats, fish and beautiful sauces that are quick to prepare or make in advance. If you want a quick snack for yourself, or an extraordinary celebration feast, all the how-to you'll need is here. 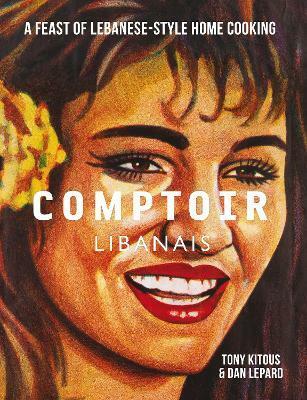 Comptoir Libanais restaurants are the most passionate provider of Lebanese and North African food blending traditional Arabic cooking with modern flavours to create wonderful easy to prepare dishes from Mezze and salads, meat and fish, breads, pastries and desserts. Using readily-available ingredients and basic kitchen equipment Comptoir Libanais contains eighty recipes for quickly prepared, healthy dishes that can be adapted for any occasion using shortcuts and skills to make impressive food quickly and simply. "The capital's best meze" * Elle * "We love Comptoir Libanais ... not only for its delicious Lebanese fast food but for its stylish surroundings" * Vogue * "Tony Kitous is central London's king of Lebanese and Middle Eastern cuisine" * Restaurant Magazine * "The new Luxe!" * The Daily Telegraph * "`[Lepard] and Kitous have produced a stylish cookbook that tells the secrets of Kitous's kitchen. Tony Kitous' first foray into the restaurant business came at the early age of 22 when he opened his first restaurant, Baboon, in 1993. Born in Algeria he travelled widely throughout the Middle East and drew on his cultural heritage to create Levant in 2000, the restaurant which raised the profile of Middle Eastern restaurant culture in the London scene. Its sister restaurant, Levantine, opened in Paddington in 2004. At the end of 2005, Tony acquired Pasha and transformed it into the most opulent and seductive restaurant of its kind in the capital. He then launched Kenza, a visual feast of Middle Eastern craftsmanship and rich design, in the City of London in 2007. The first Comptoir Libanais opened at Westfield Shopping Centre in November 2008. Dan Lepard is a baker and photographer who has worked with the likes of Ottolenghi, Giorgio Locatelli and Fergus Henderson. He is the author of the bestselling Short and Sweet and has a popular baking column in the Saturday Guardian. He writes frequently for Sainsbury's Magazine and is also currently designing a range of baking products for Sainsbury's.